Ronda Rousey’s nightmare is not going away. Cris Cyborg Santos may be fighting in Invicta but she still has her eyes set on Rousey and the UFC. Dana White has said numerous times he’d consider the fight if Santos dropped weight. Well it’s time to start the negotiating. Santos left the UFC last year after failing to secure a fight with Ronda Rousey. It amazed me then and it amazes me today that the UFC let that fight get away but they did. Rousey went to Invicta yet the war of words between Rousey and Santos haven’t stopped. Rousey has always said that Santos needs to drop to 135 to fight her. Santos has finally said she’d do it. Santos released a statement to Inside MMA where she proclaims that she will drop to 135 for three fights. Santos wants one fight against Invicta’s 135 pound champion this summer and says she will remain at 135 for two fights with Rousey. According to Cyborg, there will be no more excuses not to make this fight. “You have fought 154 in the Olympics and 145 in MMA. You can meet me at 140 easier than for me to go down to 135. The only reason you want the fight at 135 is because you feel that is your only chance because you hope the weight cut will affect me. You guys say I’m irrelevant, yet watch my highlights. The true MMA fans not only know me, but know I’m the best. Sad that you give the true MMA fans no recognition by saying that they don’t matter. Of course the Rousey defenders will dismiss this challenge and accuse Santos of using PEDs. I always found that to be a bogus excuse because if she does use them, she’ll get popped. Santos is upping the ante on those critics and addressed that concern head on. So there it is. I never understood how a guy like Dana White always calls out fighters for ducking fights yet continues to defend Rousey for not fighting Santos. To me the answer has always been obvious. He is afraid that Rousey will not only lose, but get pummeled, thus exposing his self-proclaimed “biggest star ever.” That’s the only reason in my mind that White could justify Rousey passing on a fight that could do the biggest buyrate of all-time. I also think Rousey has gotten a free pass from most of the media and fans for ducking this fight. Rousey has always used the weight excuse. Yet, as Cyborg points out (and I have been pointing out for almost a year), Rousey has fought at higher weight. The UFC have desperately tried to make super fights with fighters in different classes meeting at a catchweight. Why 140 has never been an option is just mind boggling to me. Rousey has fought at 140 or higher so the idea that she refuses to come from 135 for a fight that would be gigantic doesn’t make much sense. The ball will be in Ronda’s court and the pressure will be on her if Santos makes 135 and wins her fight. There are no excuses from that point forward. Rousey could use the undeserving challenger excuse but let’s face it. The UFC 135 pound belt was handed to her in the first place and Miesha Tate certainly wasn’t deserving of a shot. Ronda has done a lot of talking about Cyborg. I don’t see any way out if Cyborg makes weight. I am pulling for Cyborg only to see how this story plays out. 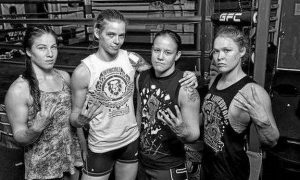 If Santos makes weight and wins her fight, the next move will be Ronda’s and it will be fascinating to see what she does. It will be even more fascinating to see what Dana White does if she says no.